I’ve been busier lately than ever before. Planning a wedding, teaching a college course, running a library, making and selling photos and — for the first time in a long while — writing, writing writing. Home improvement projects were not really on my agenda for February, but the house often demands my attention at the most inconvenient time possible. I hadn’t noticed until she asked, but once I looked, I realized something was certainly wrong. I removed the toilet and discovered that the wax ring that forms a seal around the flange had completely disintegrated. There was nothing left but some residual black goo. The flange had corroded completely through, and the closet bolts could be pulled loose with almost no effort. I pulled up the linoleum tile and discovered that the plywood subfloor around the sewer inlet was black and rotten in a radius of about a foot in every direction. Using a circular saw, I cut out the rotten section of the plywood subfloor, and discovered that some of the joists underneath were also rotting. The project was getting bigger. Removing the old flooring required me to disconnect and remove the vanity, and pry off the moulding all around the perimeter of the room. 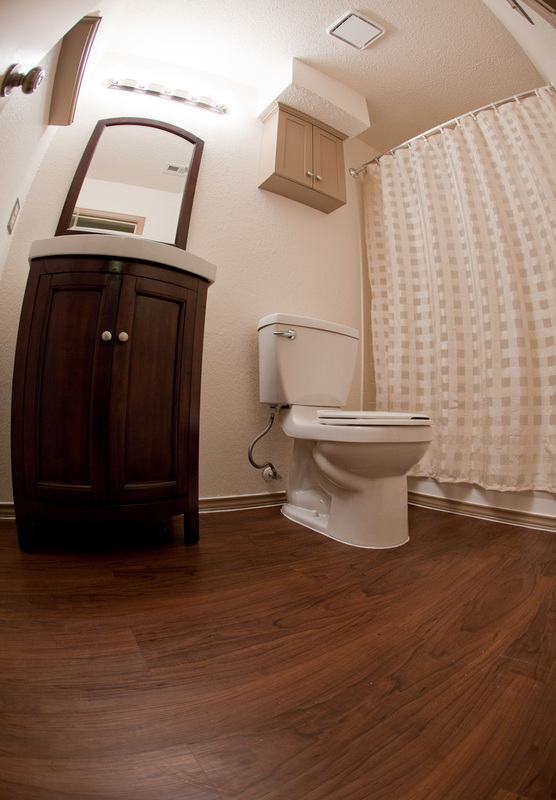 I also had to pull up the transition where the carpet from the hallway intersected the linoleum bathroom floor. Next I cut several 2x4s to replace or reinforce the bad joists. As I was attaching these, carpenter ants began to spill out of holes in the old joists. Another fun development, requiring chemical warfare. I tried to remove the old flange, which was bonded to the PVC sewer line with solvent cement. I almost managed this step, but when I was nearly finished I ended up breaking the sewer pipe a few inches below the cuff of the flange. This was scary, because it was damage I didn’t know how to repair. After a few hours watching plumbing videos on YouTube, I felt ready to try to replace the damaged section of PVC. It turned out to be easier than I expected, and the new sewer line is at least as sturdy as the original. Looking back at the whole project, this is the step of which I am proudest. I am sure that if I had called a plumber to fix this instead of doing it myself, it would have cost several hundred dollars and had the same outcome. 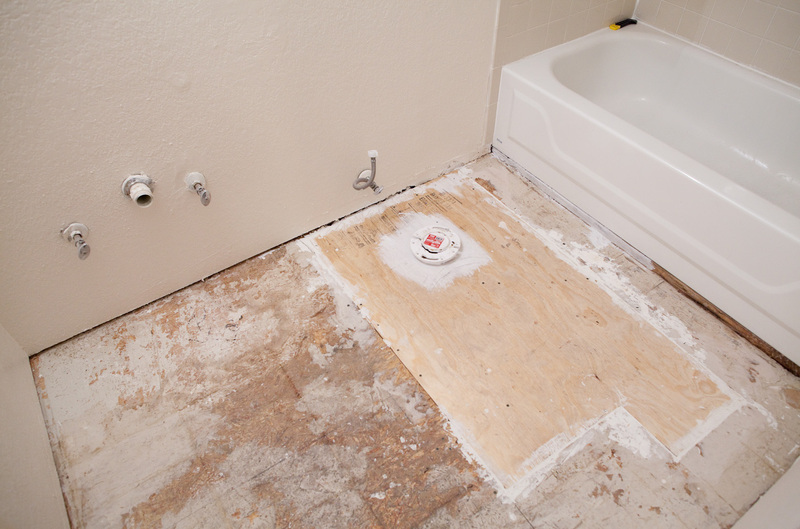 Next I cut a new piece of plywood subfloor, and sawed a hole in it to accommodate the sewer outlet. I put this in place, screwed it down to the new joists, and filled in around the edges with heavy duty spackling paste to form a smooth intersection with the surrounding sub-flooring. It seemed a good opportunity to paint the entire bathroom. Since there was no flooring installed yet, I wouldn’t have to worry about dripping paint. Suzi helped quite a bit with this step — we even painted the popcorn ceiling. We contemplated replacing the bathtub, but compromised and instead touched up a few small dings in the porcelain which were just beginning to show rust. I also re-grouted some of the shower tiles. Next we put down new flooring, new moulding, a new toilet, new light fixture, new vanity, new sink, new faucet, new p-trap, new faucet connections, new cabinet, new toilet paper holder, new towel bar, new shelf, new hand towel ring, new doorknob, new hinges, new robe hook, new mirror and new faceplates for the light switches and power outlets. « Professor with disproportionate retaliatory instincts, you say?